Manufacturers make toilet bowls from ceramic and apply a thick glaze for protection. 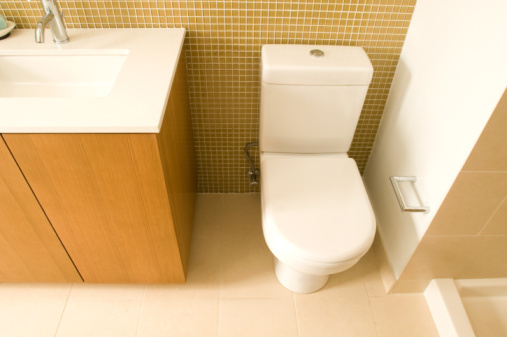 Toilet glazes stand up well to general cleaning, but will show scratches over time. Using scouring powders, acid-based cleaners, steel wool, pumice or sandpaper to clean tough stains will leave scratches on the toilet. Repairing toilet bowl scratches as soon as possible prevents the recesses of the scratches from developing difficult-to-remove stains that make the toilet bowl look dirty. Toilet bowl scratches are unsightly. Clean the toilet with a commercially available toilet bowl cleanser and flush the water. Turn the water supply to the toilet off if the scratches are inside the toilet bowl. If scratches are on the outside, skip to Step 4. Generally, plumbers mount the water supply valves on the lower portion of the wall behind the toilet. Flush the toilet to remove all toilet water. Dry the scratched area with a rag. Dip the corner of a rag in denatured alcohol and wipe the surface of the scratches. Denatured alcohol evaporates and dries quickly. Mix a two-part, epoxy-based ceramic or porcelain repair paste to develop a heavy cream-like consistency. The repair pastes come as part of a repair kit made expressly for repairing sinks, toilets and glazed tile. Dip the tip of the included plastic or wood applicator or a toothpick into the repair paste. Lay the tip of applicator or toothpick into the scratch and pull it along the scratch to fill the recess. Add more epoxy to the applicator as necessary to fill in the scratch and make it even with the existing finish. Repeat for each scratch. Wet a microfiber rag and wring it out, leaving it barely damp. Wipe the area of the repairs to remove excess epoxy from the surface surrounding the scratches. Allow the epoxy to dry fully, usually two to three hours before restoring the water supply.